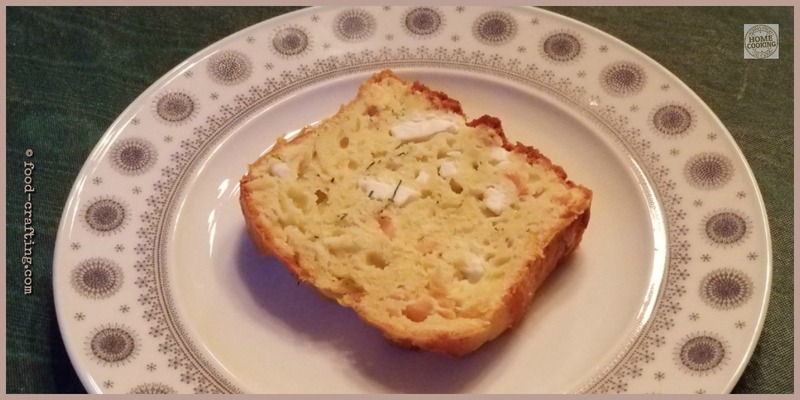 Smoked Salmon Feta Cake – Want to impress your guests with appetizers just a little different than crackers and dip? 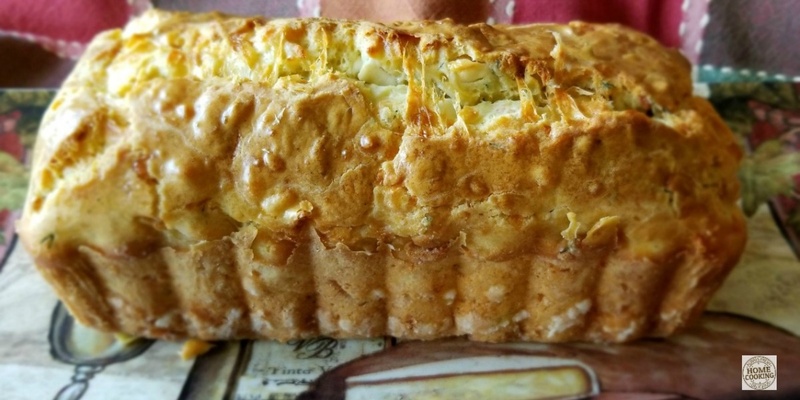 Try to bake one of these savory loaves! During my “séjour” in France a couple months ago, we prepared impressive apéritif sessions before dinner. Almost like a meal in itself. These little cakes made more than one appearance. Not only are the savory cakes easy to prepare with a few basic ingredients but the flavor possibilities are almost endless. We always try to include smoked salmon in an appetizer platter but the cost can become prohibitive when you have 25 or more guests. Smoked Salmon & Feta Is Just One Of Many Flavor Combos! Want to double the recipe for an impressive size loaf? 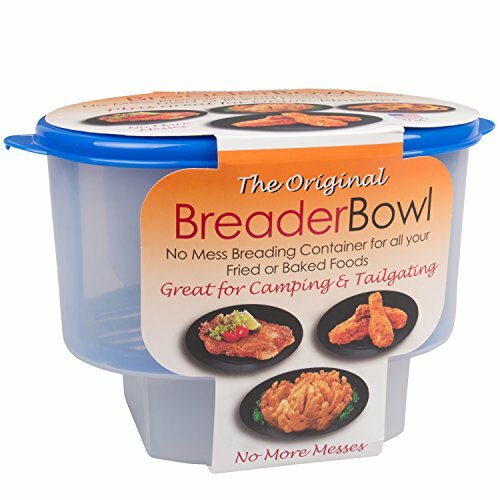 This is the perfect party pan! A superior non-stick finish on the pan makes it easy to care for and easy to release savory cakes. Imagine presenting a perfectly baked salmon and feta loaf (or any other savory or sweet cake) on a beautiful wooden serving board like this one. I use these baguette boards for cheese and charcuterie aperitif displays. Slice the loaf into even slices then cut again down the entire length of the loaf for 32 ideal portions. Prepare two or three different savory loaves (let’s say a blue cheese and walnut loaf or leeks and Brie) for the ultimate variety. Feta cheese is the perfect cheese to use in combination with a second ingredient. How about sun dried tomatoes and feta? Zucchini and feta? I never use more than two ingredients in a loaf. Smoked salmon is one of the most expensive combination for a large gathering. The recipe proportions are perfect for an 8 inch loaf (this is the one I used) pan baked for 40 minutes. 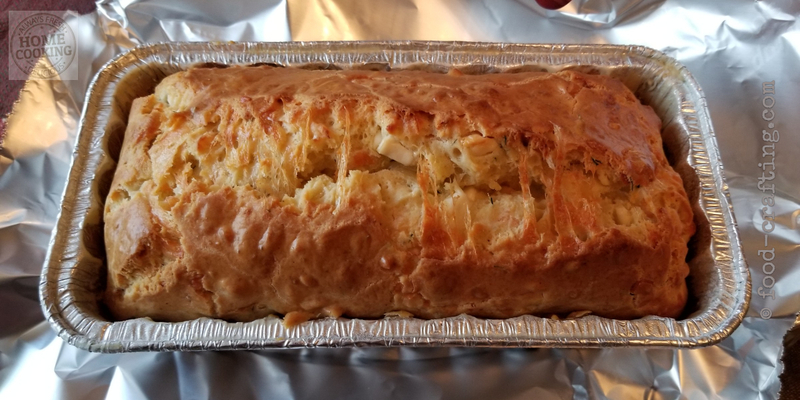 Any change in the size of the loaf pan – as in the 16 inch loaf pan pictured above – will require doubling the recipe and adjusting the length of time in the oven. Impress your guest with a Smoked Salmon Feta Cake. An easy way to stretch the best smoked salmon for a crowd, this is a very basic recipe with many flavor options. The salmon and feta combination is perfect! Using spray olive oil (or butter), grease and flour the loaf pan. I used an olive oil spray to get into all wrinkles of a foil loaf pan. In a medium sized bowl, add the flour, baking powder, eggs, olive oil and freshly cracked pepper to taste. Add a pinch of salt. You can use a hand blender on the lowest speed to combine the eggs with the flour, baking powder, olive oil and pepper into a smooth batter. Add the room temperature milk to the batter – carefully fold into the batter, then add the salmon, the minced dill, then the Gruyère and the feta last. Fold all the ingredients into the batter until evenly combined. Go gently as the more you mix the batter, the more the feta will break into smaller pieces. Do not over mix the batter. Pour into the buttered and floured loaf pan. Spread to the corners. Place in the oven for 40 minutes or until golden and cooked through. I use a cake pick to check. Allow the cake to cool in the pan, on a rack, until barely warm. 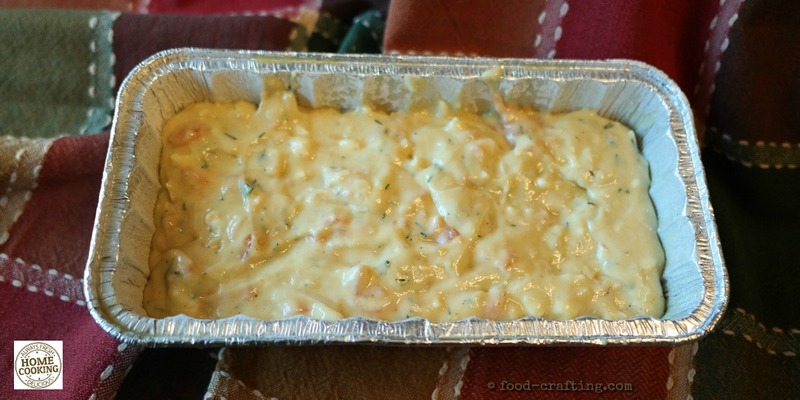 Remove from the mold carefully and place on serving dish or wrap in non-stick foil if not serving immediately. 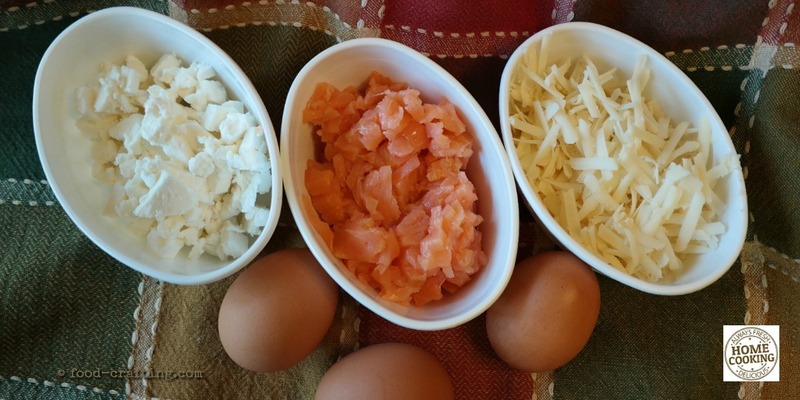 Buy salmon slices rather than thin nova – “lox”. Center cut slices are of even thickness allowing you to quickly create small dice that can easily be folded into the batter. You don’t want salmon shreds that will clump together. For a more intense, saltier flavor and a different consistency to the salmon, use smoked sockeye fillets (620 mg of sodium). Flake the fillets into small pieces about 1/4 to 1/2 in size. The feta crumbles easily – handle as little as possible. Shred the gruyère using a cheese grater like this one. These box shaped shredders are sturdy and above all – steady! The rubber handle allows for a good grip and the rubber base keeps it from slipping on the counter. Allow the cake to cool until barely warm before slicing. To cut full slices, use a serrated knife (like this one) that is slightly larger than the width of the loaf. You don’t want to use a back and forth sawing motion. Aim for a “once through” clean slice from top to bottom. 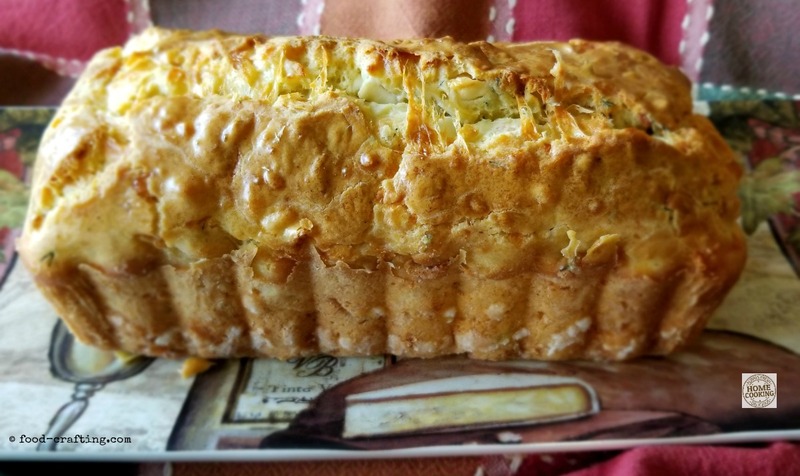 To make smaller portions from a larger or longer loaf – or even from an 8 inch loaf – first cut lengthwise along the entire length of the loaf, then crosswise. It allows you to hold/pinch the loaf together as you cut slices. The 8 inch loaf could easily be cut into 20 portions. The Pinterest pin above shows a slice cut immediately after the cool down period. The image below show a slice cut the next day (the cake was wrapped tightly in a loaf packing bag then in a freezer weight zip lock bag, refrigerated and brought to room temperature before cutting more slices. Related: Favorite Appetizers and coming soon… more savory cakes! 1 Smoked Salmon & Feta Is Just One Of Many Flavor Combos! 2.6 Related: Favorite Appetizers and coming soon… more savory cakes!